I have three points to make about today’s progress at the east end of Tradd Street. 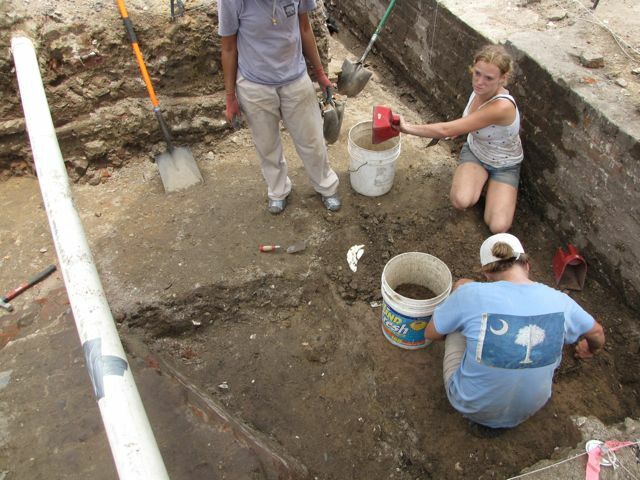 First, the student archaeologist continued to carefully work their way down through the layers of sediment surrounding the remnants of the redan. 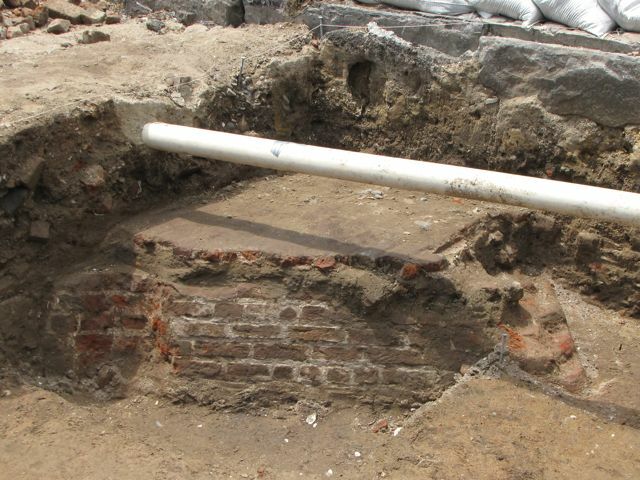 As we found last year, there is an area of brick debris in the area immediately east of the remaining wall, representing the demolition of the upper levels of the wall ca. 1784–85. 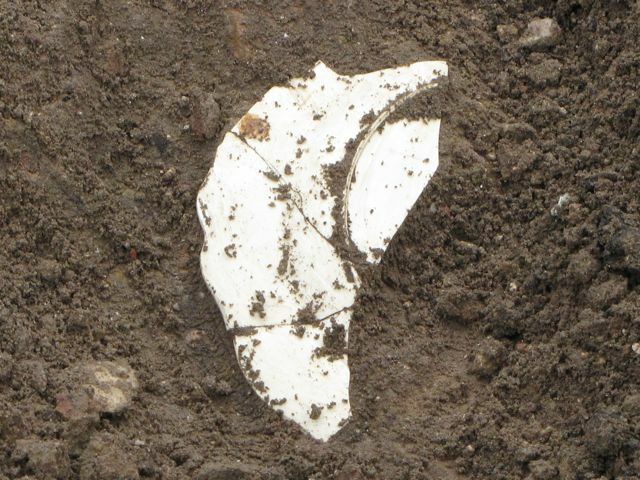 Amidst the area of rubble and earth just south of the redan the students also uncovered a large fragment of an eighteenth-century ceramic plate, probably royal creamware. I’m including two photos of the plate—one showing its physical context and a closer view. 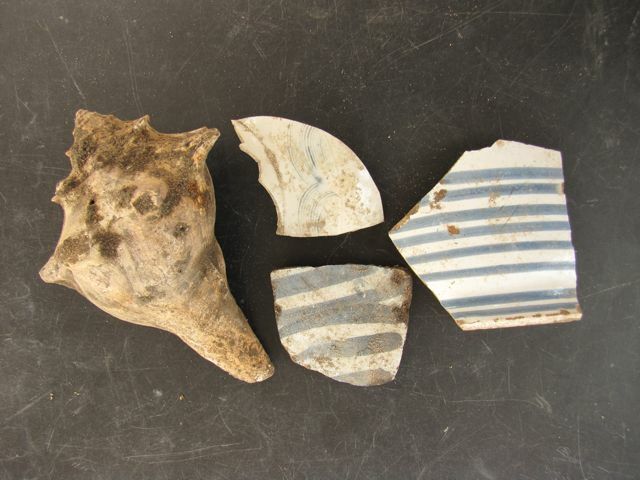 This object brings me to today’s second point, that large number of ceramic, glass, tile, shell, and bone artifacts found at this site all represent kitchen-related activities. This fact seems perfectly in keeping with the presence of the Lower Market at the east end of Tradd Street between 1750 and 1800. There may be some people that are disappointed that we’re not finding buttons, buckles, coins, and other metal objects, but the archaeologists are very pleased with the consistency of the found materials. Finally, I’ll point out that the archaeologists opened a new unit at the western edge of the dig site. 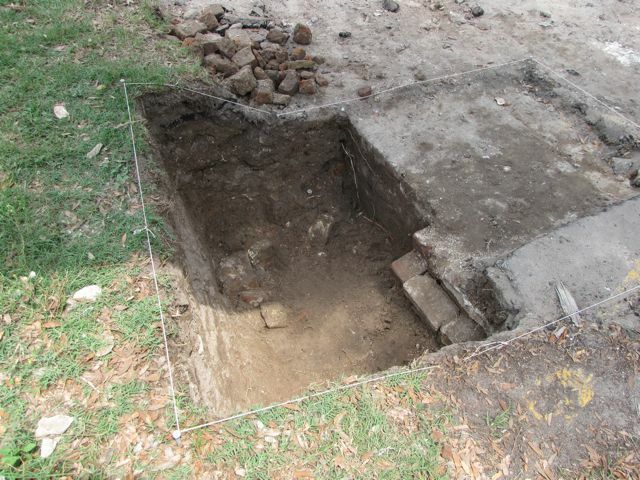 This was done for one principal reason—to determine whether or not the large foundation wall of the extinct building known as Vanderhorst’s North Row, which we located on the first day of this dig, extended westward through the rest of the site. Unfortunately for our purposes, the new unit revealed that the foundation does continue westward, and thus its construction ca. 1805 probably obliterated part of the southwestern wall of the old redan. At least now we know!